When geeks put on hiking boots, grab their sunglasses and hiking poles, it's LBW time. The 15th Linux Beer Hike, also known as the Linux Bier Wanderung (LBW) , took place from August 17-25, 2013 (see the "Linux Bier Wanderung" box). 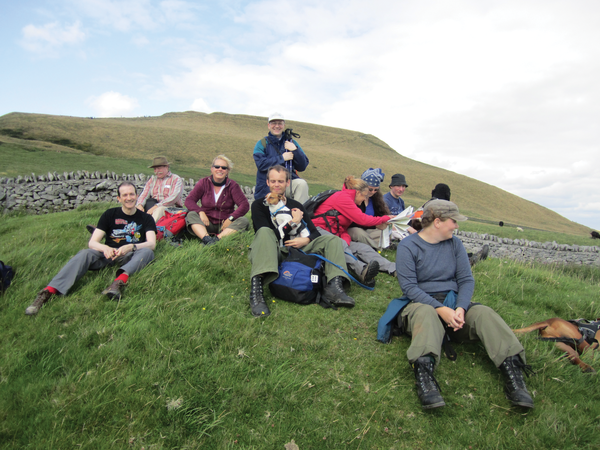 Hikers and hackers from various countries all over the world met up in Castleton , in the heart of England's Peak District National Park. The village is surrounded by steep hills, with the most prominent being the Great Ridge two miles to the northwest. At the western end of the ridge lies Mam Tor (517 m, 1,696 ft), the "mother hill." The LBW is a week-long event that takes place in a different European country each summer, drawing together Open Source and Free Software enthusiasts and friends from more than a dozen different countries. It is an entirely volunteer-run event, funded from a combination of donations among the attendees toward the cost of the hall, Internet access, and other amenities. Castleton turned out to be an ideal place for a walking holiday. Several hikes started at the village itself, and the geeks enjoyed fantastic views from up the hills. During the week, there were several shorter walks in the Hope Valley, including Winnats Pass, Lose Hill, Hollins Cross, Mam Tor, and Ladybower Reservoir. Some more advanced hikers went on longer trips, for example, to Kinder Scout, a moorland plateau at 2,087 ft (636 m) above sea level. One day, we went on an advanced pub crawl. A walk from Marple Bridge to Whaley Bridge led us past several canal tow paths, cycle tracks, forests, rivers, lakes, and hilltop moorland – of course, there were plenty of pubs along the route, and we tried our best to sample many of the local beer specialties. Speaking of beer – to give attendees a better understanding of how different ingredients affect the beverage, a controlled tasting was held at the hall. One member of the group turned up well prepared with six kegs of home-brewed beer. After a brief talk about different types of yeast and hops, we got to sample the six beers with surprising results. It turned out that Belgian noses in the audience reacted instantly to the smell of the Belgian yeast. There was a similar reaction from the Germans when presented with hops commonly used in German beers. The British, of course, would simply drink anything, whereas the Scandinavians were impressed that one person could afford that much beer. The week also included technical talks, including a presentation on optical voice communication with a 1W red LED and a 4-inch telescope. The discussion on the open source telephony system Asterisk  presented the audience with some ideas on how to achieve genuine high availability with Asterisk. Most of the techniques shown were based on experiments the speaker had tried himself – just not on production systems. A huge success was the international potluck. People brought food or drinks representative of their home countries. A trip to a local curry house and to the beer fest in the neighboring village turned out to be fun as well. A traditional British pub quiz was held one evening. It was tailored to the event by featuring pictures of 1970s computers, famous (and infamous) people from the history of computing, and absolutely no pop music at all. LBW 2013 was a lot of fun. I would like to thank the organizers and everyone who attended, geeks who shared their knowledge, provided advice on technical issues, and especially the nice people of Castleton who gave us a warm welcome. I'm looking forward to seeing you again next year!